Keeping an eye on the weather is a daily routine for many people. A check of the temperature, the chance of precipitation and what’s happening 90 miles to the south-southwest gives an indication of what the day will bring. However, Baylor professor Trey Cade, PhD, keeps his eye on weather conditions roughly 90 million miles away. Cade is director of the Baylor Institute for Air Science, and his research focuses on space weather. Problems include high-radiation dosages and magnetic storms, disturbances in the Earth’s magnetic field that can cause widespread power outages, disrupt communication systems, GPS navigation and damage or disable satellites. Astronauts and airline passengers are susceptible to high-radiation dosages. Cade says a National Academy of Sciences study shows that an extreme space-weather event could have as much a $2 trillion impact on the United States economy. know fairly well, but such space-weather ramifications were recorded as early as the Industrial Revolution. “As soon as telegraph systems started being developed and used for practical applications worldwide, they started getting disrupted by space weather events,” Cade says. The solar storm of 1859, also known as the Carrington Event, caused telegraph systems worldwide to quit working. More recently, a March 1989 geomagnetic storm caused power outages across Quebec. A series of storms in October 2003 caused numerous satellite problems and radiation concerns for airline passengers and astronauts. Prior to the Industrial Revolution, space weather events led to what Cade describes as more psychological impacts. Magnetic storms can cause the Aurora Borealis (or Northern Lights) to move south of the polar regions. 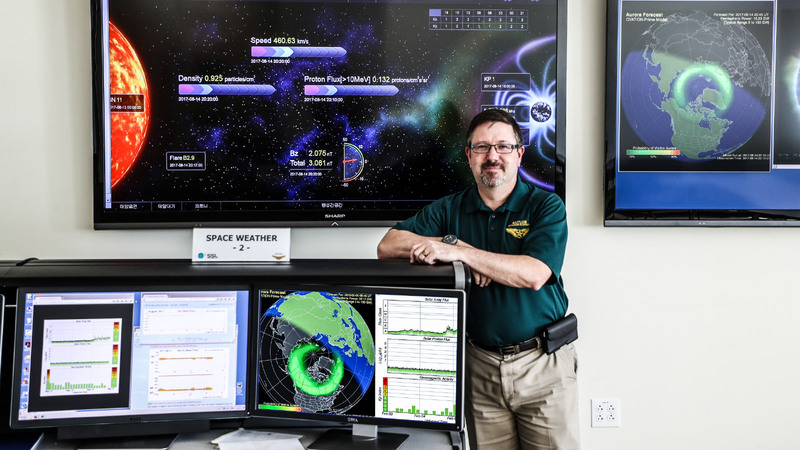 From his Space Weather Research Lab in the Baylor Research and Innovation Collaborative (BRIC), Cade monitors the sun and the Earth’s magnetic field by way of satellite-mounted telescopes and ground-based instruments. Cade teaches a space weather class in which he assumes no background knowledge, and non-science majors are welcome. Some of Cade’s undergraduate students have assisted with his research, and some have presented research findings at international scientific conferences. One such student is senior Courtney Turner, an aviation science major from Granbury, Texas. A first-generation college student, Turner is a commercial pilot who plans to give flight lessons professionally after graduation. The National Oceanic and Atmospheric Administration (NOAA) has established five-level space weather scales, much like the Saffir-Simpson Hurricane Wind Scale, for geomagnetic storms (G1-G5), solar radiation storms (S1-S5) and radio blackouts (R1-R5). About four G5 storms occur per 11-year solar cycle, while fewer than one S5 and R5 occur in the same time span. Weaker storms and blackouts occur much more frequently with level-one events being minutely disruptive. Additional information on the scales can be found at swpc.noaa.gov/NOAAscales. Taylor Robinette is a senior astronomy and aviation science major originally from Amarillo, Texas. She hopes to pursue research professionally after graduation in some space-related field. Research career opportunities abound for Robinette and other students, including universities, government agencies and companies, such as SpaceX, which has test facilities within 25 miles of Baylor’s campus. In February, SpaceX successfully launched a Falcon Heavy rocket that featured the reusable launch system development program in which rocket boosters returned to Earth and safely landed. Six months earlier, SpaceX founder and CEO Elon Musk said he believes a manned mission to Mars will be possible by 2024.